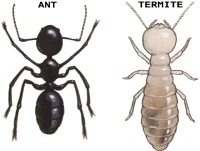 Home » Blog » Insects » Ants » Termites and Ants – What’s the difference? Termites and Ants – What’s the difference? The easiest way to tell the difference is by looking at the body of the insect, a termite has two distinct body segments with a waistline closer to the head than the tail, while an ant has three distinct body segments with two waistlines. Still confused – email us a photo!